The set of Poltergeist is inarguably one of the most notoriously bizarre Hollywood film productions of all time, widely considered to have been cursed primarily because of what happened to so many of its stars after the movie hit theaters. And honestly, there are plenty of real-life scares to justify the film's status as a little more than fictional horror. 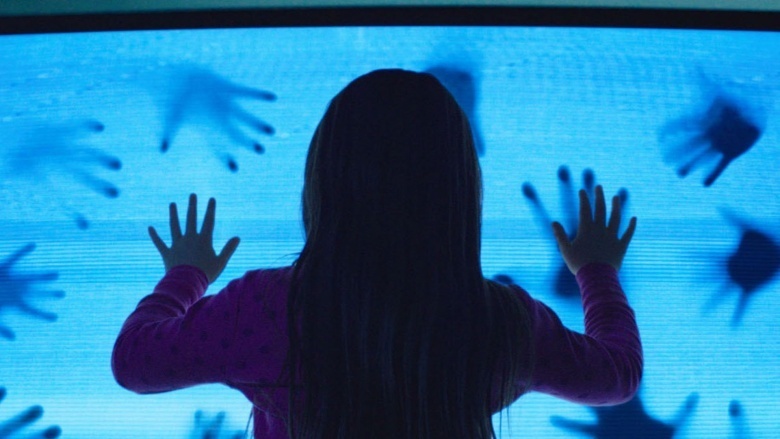 Here are some of the most bizarre things that happened to the Poltergeist film family. 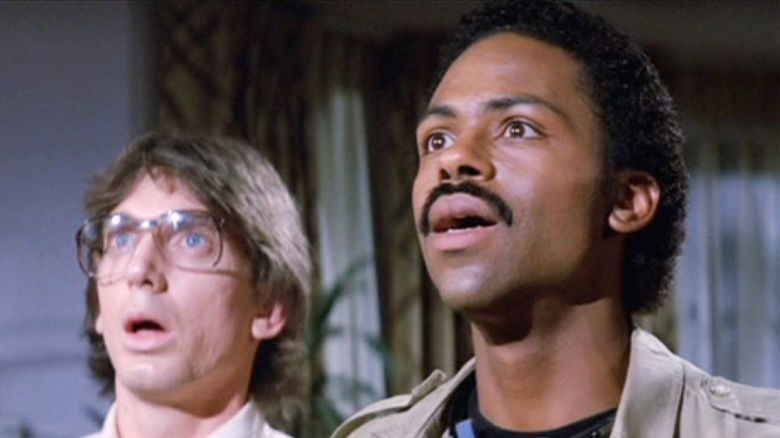 Perhaps the most lastingly buzzy aspect of the Poltergeist movie legend is that so many of its cast members — including two of the child stars from the film(s) — died unexpectedly after the film was released. The first instance happened when Dominique Dunne, who portrayed Dana in the original film, was strangled to death by her ex-boyfriend in the driveway of her home in 1982 — she passed away five days later, at the age of just 22. It was rumored that her friend, who was present during the argument, was listening to the Poltergeist soundtrack at the time, to block out the noise of their quarrelling outside. Then, in 1988, child star Heather O'Rourke died at the age of 12 from cardiac arrest, after experiencing septic shock from a congenital bowel obstruction. 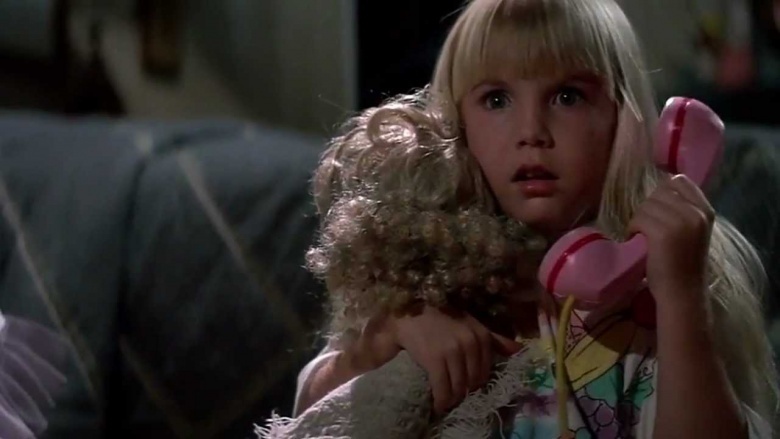 She'd completed filming on the third installment of the Poltergeist franchise a few months before her unexpected death, but the film had yet to be released at the time. Although other cast members would later perish from more natural causes, the expiration of the film's two young actresses caused many to speculate that their involvement with the movie had something to do with their untimely demises. Spooky stuff. Before Dunne and O'Rourke's deaths, there was another eerie incident which nearly claimed the life of one of the Freeling children off-screen. Actor Oliver Robins, who portrayed the middle Freeling child Robbie, was strangled by the very animatronic clown that tormented his character so in the film — if it weren't for the intervention of producer Steven Spielberg, he's not sure what would have happened to him. Nothing good, probably. As Robins recalled to Icons of Fright, "the way they shot the sequence … they didn't really have the special effects the way they do today. So, the clown doll had this extended arm and they had me act backwards … in a tight confined space under the bed." It was then that the doll's arm began to choke his neck. "The contraption caught around my neck … Steven saw that, probably in the video assist [deck], and he pulled me away from it. Who knows what might've happened otherwise. It was very fast …. Maybe I wouldn't be here today." As if that demonic clown wasn't already scary enough. As if the cast fatalities and near-death experiences weren't numerous enough, actor Richard Lawson (who — fun fact — is Beyonce's stepfather as of 2015) was in a plane crash in 1992 that claimed the lives of 27 of the 51 passengers on board, including the person who was in his original seat on the flight. Lawson said he was gifted a first-class seat after giving a fan his autograph, and the switcheroo saved his life. Standing alone, the story might seem like a mere coincidence, but with the breadth of the cast's eerie experiences, many considered this yet another installment in the Poltergeist curse effect. Achieving authenticity in a Hollywood production can be tough, especially in the sci-fi/horror realm, but this might be taking things a little too far. You know the scene when the Freeling mom is thrown in the muddy pool, and all these corpses start to float to the surface around her, freaking the daylights out of her? Well, if that reaction seemed especially realistic to you, there may be a reason; Spielberg famously opted to use real human remains as props for that scene, which might've at least been a partial source of the film's supposed curse. 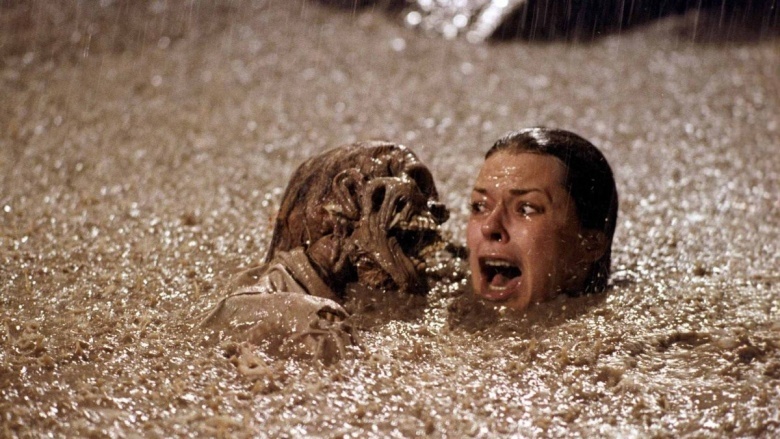 Actress JoBeth Williams confirmed as much during her Reddit AMA, writing, "I also hated working in muddy swimming pools with skeletons around me. When we were shooting, I thought the skeletons were fake, I thought the prop department made them. But later I found out they were REAL skeletons bought very cheaply. That really grossed me out." Talk about suffering for your craft. 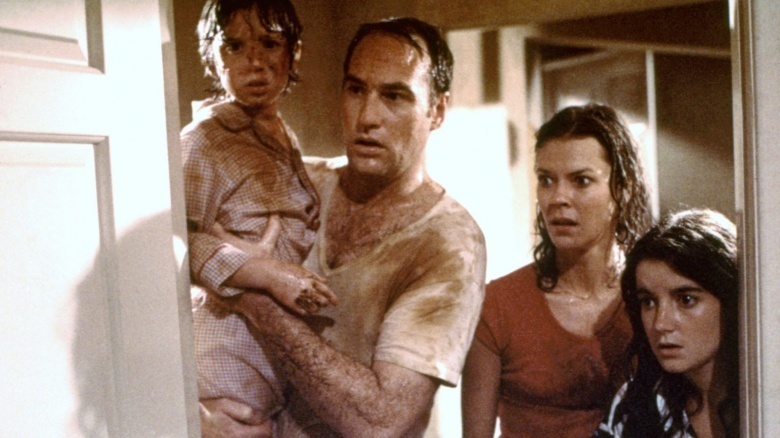 Williams experienced a series of frights in her temporary home during production on the first version of Poltergeist — she said in her AMA that the picture on her apartment wall kept shifting while she left to shoot the movie, but she later decided it was her own fault for slamming the front door. That's still just conjecture, but, hey, whatever helps her sleep at night. Author James Kahn, who was novelizing the movie, also experienced a case of the heebie-jeebies when a lightning bolt struck his building as he was finishing up the project and blew the facing of his air-conditioning unit blew across the room and struck him in the back. After that, the lights came back on and his video games "started playing themselves." We wonder what he thinks of games that they play themselves nowadays being a beloved feature, rather than something out of a freaky nerd nightmare. "The house that I rented during filming was straight-up legit haunted by a female spirit dressed in black," he wrote. "And I became aware of her within the first few days of staying in the house. And only after I left did I receive a call from the previous owner, who had moved back in, who was terrified by the goings on in the house, and wanted to see if I had experienced any of it … she definitely was there. It didn't follow me back to Los Angeles, but it followed me from set back to where I was sleeping during filming." If that story was just some elaborate marketing ploy, it worked, because there are plenty of people who fully believe there was something truly otherworldly going on with the Poltergeist movies. Poltergeist II star Will Sampson, who was a real-life shaman and portrayed Taylor the Medicine Man in the sequel, performed an actual exorcism on the set of the film to rid the site of "alien spirits." He died a little over a year after the film's release, from complications associated with a heart and lung transplant. 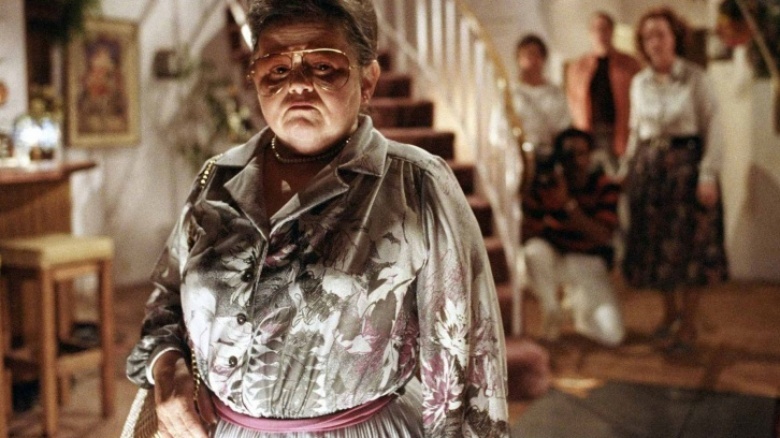 Meanwhile, during filming of Poltergeist III, actress Zelda Rubinstein (of "this house is clean" quotability) was troubled by a photographic light blur that occurred during a photo session of the actress, leading her to believe that the pic was taken at the exact moment her mother passed away. The production of Part 3 was also an explosive one, as a garage that was to be used for filming caught fire, after plastic fake ice poured onto prop cars ignited into flames and injured three crew members. "A ball of fire chased everyone out there," a fire chief responding to the scene recalled to The Los Angeles Times. "There was black smoke all over the place … This was all supposed to be done with the best of taste, but somehow it got away." The cause of the mishap, he said, was unexplained, since the crew on-set were amply prepared to pull off the shot correctly when they began working that night. It's those skeletons, we're telling you.